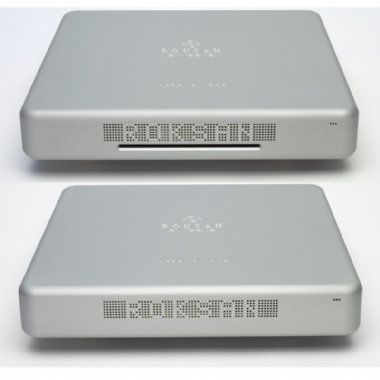 Ex Display Roksan Oxygene CD and Bluetooth Amplifier package in Silver. Excellent condition with full warranty. Free Delivery. The Roksan Oxygene CD Player is the end result of countless hours of experimentation, fine-tuning and a relentless dedication to sonic perfection. When first visiting the Oxygene CD Player, you will immediately notice the lack of buttons and switches. A sleek, innovative design with only the words ‘Less is More’ discretely printed on top of the cabinet is all that you can see. But as well as being a statement of intent, these three touch-sensitive words control all the necessary functions of the player. Touch MORE to select the next track on the disc or LESS to select the previous track. Touching IS gives access to more functions. The perfect exterior is a constant reminder of the craftsmanship within. At the heart of the Oxygene Amplifier is a high quality Class-D, digital amp that's powered by twin toroidal transformers. Despite its compact size the high quality amplifier produces a powerful 75 watts per channel - easily enough for larger rooms and low efficiency speakers. Yet the Oxygene is far more than about just brute force. With careful tuning and the use of top quality components, the Oxygene also sounds smooth and refined. The punchy bass and smooth treble blend seamlessly to give a natural sound that's perfectly balanced. Designed to appeal to more than just one sense, the Oxygene looks and feels every bit as good as it sounds. The smooth casing is available in a variety of different finishes, making it easier to get exactly the right match for your decor. The minimalist design is wonderfully free from buttons, dials and clutter, giving it a timeless style. Want to alter the source or volume? Then simply touch one of the touch-sensitive 'More' or 'Less' buttons. Constructed from a milled, one piece block of aluminium that's then bolted to the frame, the Oxygene doesn't just look good it feels beautifully constructed, too. The touch sensitive controls work flawlessly and even the remote is probably the nicest remote you'll ever handle. The weighty, metal remote feels good and is easy to operate with just the minimal amount of buttons required. Designed to get the best from your music, whatever the source, the Oxygene features Bluetooth connectivity. Simply pair with your smartphone, tablet, laptop or compatible PC and you can wirelessly stream all your stored music, plus music services such as Spotify and Apple Music. What's more, because Roksan use top quality apt-X coding, it's possible to enjoy your audio files at the highest Bluetooth quality. Despite its minimalist style, the Oxygene Amplifier is well equipped. As well as Bluetooth you can connect three line level sources. A line level output also makes it easy to add a subwoofer.